The alert setting on integration level is used as global setting in case the user forgot to set up alerting rule on interface level. If the user set the alerting rule on the interface level then this should be valid and overwrite the setting on integration if any exist. Interface level user set a value this will overwrite the value on the integration level. If user has not set anything on interface level then take the value from the integration level. So the value on the integration level is like a default value for all interfaces which don’t have any alert rule. User can setup the alerting function to get an alert whenever an Interface run into an error status. 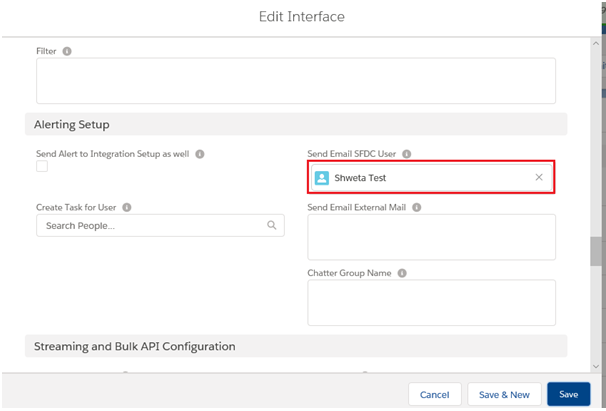 User can specify an email address where the alert will be sentSetup one more email address open the integration or the Interface and edit the part ‘Alerting setup’. Choose the user and specify the email address. We have to specify an external email address. Chatter is used to notify the user by posting failed message to Chatter Group by addition email alert. User can specify the Chatter Group on Integration as well as Interface level. Suppose we have 3 interfaces related to logistics and 4 interface related to Order then user creates 2 different Chatter Groups related to logistics and Order. User have to specify the Chatter Group on the Interface and If any error encountered apparently simultaneously error message is post to the corresponding Chatter Group. Great after creating the new Chatter Group we need to specify the Chatter Group name on the interface as far as the concern of Integration Level. Whenever any error encountered, the error message is posted to the corresponding Chatter Group. On Interface level user set the value this will overwrite the value on the integration level. Whenever user has not set any thing on interface level then catch the value from the integration level. So the value on the integration level is like as default value for all interfaces which don’t have set alert rule.